This gaming laptop packs a wallop with Haswell and Nvidia GTX chips powering a 1080p panel. Portable PC gaming doesn't much better than this. The Alienware 14 is an attempt to create a serious but portable gaming laptop. Alienware is owned by Dell, and the gaming brand has benefited from the latter's prowess in building robust laptops, as well as its buying power. As you'd hope, there's a full HD WLED Full HD anti-glare screen with superb viewing angles. The colours on the Windows 8 Start screen still look awesome even when viewed from an extremely acute angle. The anti-glare coating can make pale colours look a little grainy at first glance, but games look superb on it. Sadly, it's not a touchscreen. The model we've tested is the third most powerful of four Alienware 14 models on offer in the UK (the selection is slightly different in the US). The next model up has a slightly faster processor - the 3.7GHz Core i7-4800MQ rather than the 3.4GHz Core i7-4700MQ seen here - and costs more. It has the same 2GB Nvidia GTX 765M graphics. The lower two models have a lower-end graphics card (the 1GB Nvidia GT 750M) and the very lowest model swaps the 1080p display for a 720p one. The top two models - including this one - boast a whopping 16GB of memory, while the lower two models have 8GB (which is still not to be sniffed at). There is one crucial thing you need to know about this laptop: at 2.77kg, it's surprisingly heavy. When we say it's portable, we mean in gaming terms rather than the standard set by most notebooks. After all, this is around the weight of two Ultrabooks. It certainly looks the part, though. There are lights everywhere, from the logo to the touchpad to the lid. As you'd expect, it's all customisable via the Alienware Command Center, so you can have whatever colour you like whenever you want, anywhere on the device. The chassis gets warm when the machine is working hard, but not hot, and it has a smooth matte finish that'll easily resist sweat. Alienware has really drawn on Dell's expertise with its most recent laptops, and while it's unmistakably different from, say, a Dell XPS 15, the Alienware 14 is still a perfectly usable notebook when you're not gaming. The keyboard feels a little slippery, but the trackpad is excellent and won't let you down. As well as HDMI, DisplayPort and full mic and headset ports, there's also an SD card slot, two USB 3.0 ports and - rather unusually these days - an optical drive. It's a Blu-ray player too, which is perfect if you want to connect up a large display to it. All the Intel processors used in the Alienware 14 series are from the latest generation, launched this summer. In our tests, the processor and gaming performance easily outgunned near rivals. The benchmarks we saw were little short of stunning. Performance and power are the real raison d'être here: serious specs that can be taken from one location to another. 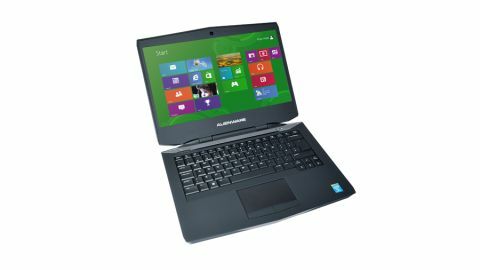 It's a machine designed for gamers but is also great for those who need a high end laptop for applications such as video editing, but who want the look and feel of a consumer laptop rather than a business-oriented workstation. In other words, the fact the Alienware 14 is heavy doesn't really matter - it's all about what it can do.